JUMP IN HOSTEL is located in Budapest downtown near to the famous pedestrian precinct Váci street and from here a few minutes walk the River Danube where you can admire the panorama of the city and the Royal Palace. 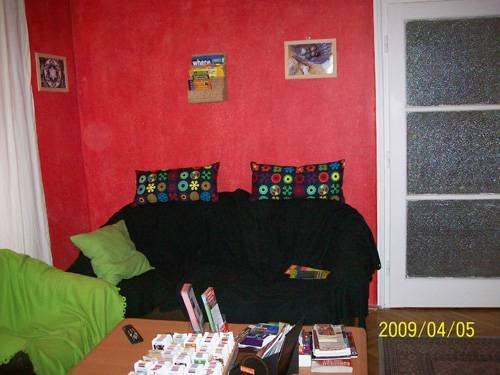 We are a very new and cheap hostel in the absolute downtown, in the heart of Budapest. The location is very lucky, surrounded by pubs, restaurants, cafés, nightclubs, movies, post office, ruin pubs, which are a very unique places maybe only in Budapest. Public transportation is easy, there are two metro lines within a few minutes. Blue metro line (M3) and the bus 7 are only a few meters and make your transportation easier in Budapest. JUMP IN HOSTEL is in the Pest side but only a short walk or 1 bus stop and you are in the beautiful Buda side. We have a welcoming staff with useful advices and easygoing atmosphere, common room where you can exchange your experiences, watch TV, talk and eat. We offer cheap accomodation, Cable TV, movies with DVD libary and music collection. Our staff give you advice about Budapest, will arrange walking tours, bus tours, boat , caving, wine and other tours and activities and help you organize your stay in Budapest. Check-in and check-out time is absolutely flexible, no curfew, no lockout. We can provide homey and friendly athmosphere, free morning café and tea and welcome drink when you arrive. An ideal place to start your nightlife and cultural tour as well. We have a 11 beds dormitory room which is very enjoyable where the hot colours prevail. We welcome small groups also. The common room is very comfortable. Here you can use the internet, watch TV or only relax. And you can get a lot of useful information about the city. The 3rd room is our 2 bed private room. It's ideal for couples or whom would like to be a bit separately. We hope you will enjoy yourself in our hostel. Catch the bus 200 to the last stop (Kobánya-Kispest), take the blue metro line (M3) and get off at FERENCIEK TERE. This is the center of the city. You have to go up from the underground where you see the caption KOSSUTH LAJOS UTCA. From here 2 minutes walking the first corner where you have to turn left to VÁROSHÁZ UTCA. Jump In Hostel is located at number 6 of Városház utca. Press the Jump In button and our recepcionist will open the door. The charges of the hungarian taxi companies is about 4 thousand HUF (approx. 20 euros) per a trip from the airport to anywhere in the Pest side. Cheaper if you call them by phone. ZÓNA TAXI is a special airport taxi company. The prices about 3 thousand HUF to us / taxi. Passengers are taken to the previously requested address by microbuses with eight toelevenseatsfrom Budapest Airport to any point in Budapest or from any point in Budapest to Budapest Airport. Catch the red metro line (M2) in direction to DEÁK TÉR and get off at the 3rd stop DEÁK TÉR. Change the red metro line (M2) to blue metro line (M3) in direction to KOBÁNYA-KISPEST and get off at the 1st stop FERENCIEK TERE. The charge cannot be more than 2 thousand HUF (approx. 12 Euros whether you go from Keleti or Nyugati). On the railway stations are some hustlers who try to inveigle you to bigger hostels and assure you that our hostel is not even exist. Be careful with them!!! Take the blue metro line (M3) in direction to KOBÁNYA KISPEST and get off at the 3rd stop FERENCIEK TERE. Catch the red metro line (M2) in direction to ÖRS VEZÉR TERE and get off at the 4rd stop DEÁK TÉR. Change the red metro line (M2) to blue metro line (M3) in direction to KOBÁNYA-KISPEST and get off at the 1st stop FERENCIEK TERE. Catch the blue metro line (M3) in direction to ÚJPEST KÖZPONT and get off at the 5th stop FERENCIEK TERE.